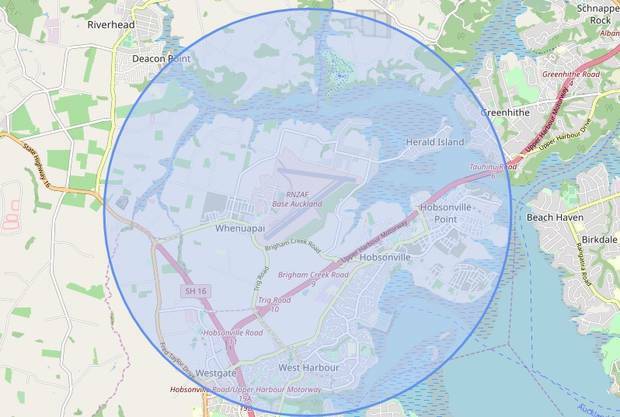 The Air Force base at Whenuapai has issued a reminder to Hobsonville Point locals about drone rules following two serious incidents. 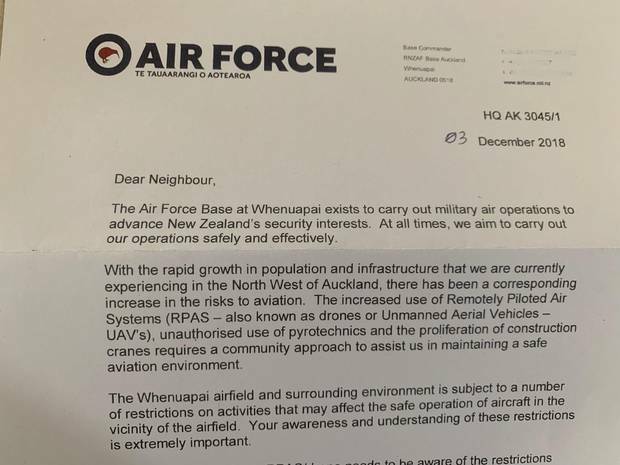 A spokesman for the NZDF says a letter to locals from Whenuapai base commander Group Captain Daniel J Hunt, "is not in response to any particular incidents – it is part of an ongoing education campaign in the area." Airways - which controls both civil and military airspace - says the same but also tells the Herald there have been several drone incidents around the Whenuapai base recently, at least two of which have led a temporary suspension of operations. Airways Head of Strategy Trent Fulcher says it's part of a disturbing trend for the Crown agency. "We are seeing a concerning number drones operating illegally near airports throughout New Zealand. We are recording at least two of these types of incidents weekly," he says. "The most recent incident we recorded in the Whenuapai control zone was on October 5. The pilot of a plane spotted a drone flying unexpectedly near Paremoremo Prison which closed Whenuapai airspace for 20 minutes." The base was also forced to temporarily suspend operations on April 9 after a near-miss between an Air Force SH-2G(I) Seasprite helicopter and a drone, which came within 60m. "We expect this to increase over the summer with drones high up on Christmas wish lists." Airways, the Civil Aviation Authority, the office of the Privacy Commissioner and other government agencies have been trying to educate the public about safe drone use following near-misses at Auckland Airport and Whenuapai, but Air Force spokesman Phil Murray says while most are responsible, "some are still unaware of the rules." More than 11,000 drone owners have voluntarily registered via Airway's Airshare site. But with basic drones now selling for $200 or less, it's likely there are thousands more. Most now include cameras, which is why the Privacy Commissioner has entered the fray. The CAA's drone rules (see list below) are perhaps tighter than most members of the public imagine. They include that a drone can only be flown in daylight, only within line-of-sight, and only below 120m - and that you must get a person's permission before flying above them, or an owner or manager's permission before hovering over their property. But for Hobsonville Point residents, they're tighter than most. The whole of the special housing area falls within what Airways calls a Military Operating Area (mapped here), where permission from an administrative authority (in this case, the RNZAF base at Whenuapai) is required to fly a drone. In fact, residents are hit by a double-whammy, as their subdivision (bar the outer reaches of Bomb Point reserve) also falls within 4km of the air base, meaning it's covered by the blanket rule of no drone flights within that distance from any aerodrome. A section of the Air Force letter to Hobsonville Point residents. The population on the ex-Air Force land at Hobsonville Point has gone from a handful to around 4000 over the past few years, and is set to double again before the development wraps up - while Whenuapai is pegged to get 8000 to 10,000 homes as the city fringe expands. In his letter to residents, Base Commander Daniel Hunt says "With the rapid growth in population and infrastructure we are experiencing in the North West, there has been a corresponding increase in the risks to aviation." He provides links to drone rules on Airways' Airshare website, which are worth everyone noting as drones fall in price and grow in popularity. It is also prohibited to fly a drone above designated dog areas in parks and beaches, stadiums, Auckland Botanic Gardens, Auckland Zoo, Western Springs, Aotea Square, Cornwell Park, Wynyard Quarter or Tūpuna Maunga (ancestral mountains such as One Tree Hill and Mt Eden) without permission. Amateur drone jockeys can get exemptions granted via Airshare.co.nz, while those who become CAA-licensed droned operators get broader parameters on a permanent basis. Drones are too small to be picked up by Airways' current systems, but falling the various near-misses over the past 12 months, the agency is readying new detection technology. "We are currently trialling a drone detection system at Auckland Airport. These are radar-based systems capable of seeing small metal objects like drones up to 10km from the airfield," the Airways' Fulcher says. "These are not live trials and the detection systems aren't feeding information to our air traffic control network. Data gathered in the trial is being assessed ahead future implementation," he adds. "Integrating drones safely into New Zealand airspace is a top priority for Airways and detection systems are one of the building blocks that will support a future Unmanned Aerial Traffic Management (UTM) system." It's too early to say when the system will be rolled out, he says. 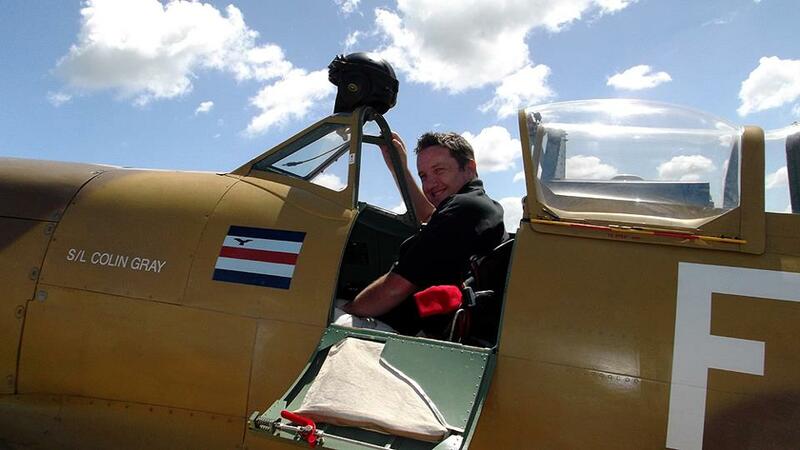 Wouldn't it be nice in these circumstances if Hobsonville was still an RNZAF Base!